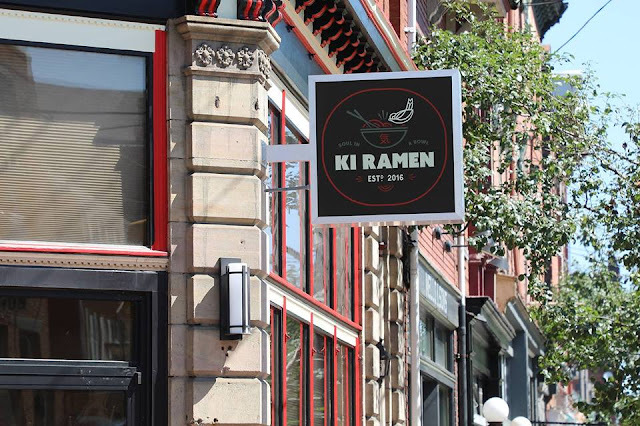 PennsylvAsia: Lawrenceville's Ki Ramen to hold soft opening, August 2. Lawrenceville's Ki Ramen to hold soft opening, August 2. Pittsburgh has been looking forward to Ki Ramen since it was first announced last summer, and the new ramen place will hold its soft opening tomorrow night, August 2. It's that time! The pop up events were great but now we are excited to invite you to come and take it easy at our house. Come and join us for our soft opening this Wednesday, August 2nd from 5 pm - 12 am at our freshly painted location on the corner of 44th and Butler Street in Lawrenceville. We will be serving select items from our full menu that include our unique Ramens + Add on's, Snacks, and Cocktails. Meat lovers bring your vegetarian friends because we will have something for everyone. Ki Ramen is located at 4401 Butler St. in Lawrenceville (map), and is a collaboration between Roger Li of Umami (an izakaya that opened in the neighborhood last year) and Domenic Branduzzi of Piccolo Forno.